Big-name actor cast as biblical Noah, Russell Crowe Reported to Set Sail as ‘Noah’, After Christian Bale drops out of the film, another A-list star takes his place on the ark. It looks like Russell Crowe is about to start gathering animals two-by-two. Deadline reports that the Oscar-winning star of "A Beautiful Mind" and "Gladiator" will be playing the title role in the Biblical adaptation "Noah" for director Darren Aronofsky. It's a high-profile role for Crowe, whose recent films have been a series of box office disappointments. His last film, 2010's "The Next Three Days," only took in $21 million domestically on an estimated $35 million budget. That followed "Robin Hood," a $200 million production that earned $105 million in the US. His two features previous to that, "State of Play" and "Body of Lies," both failed to crack the $40 million mark in this country. Is it a big gamble to put Crowe in the lead of an estimated $100+ million epic production? Maybe not. Crowe is still an international draw, though, and "Robin Hood" grossed over $320 million worldwide. Plus, the story of Noah and the Ark crosses many cultures, appearing in Jewish, Christian, and Muslim texts. Deadline also noted that this movie will join a flood (pun intended) of other Biblical epics currently in development, including a new take on the story of Moses to be potentially directed by Steven Spielberg. This will be Aronofsky's first film since 2010's "Black Swan," which earned five Academy Award nominations including Best Picture and Best Director. It's star Natalie Portman also took home the award for Best Actress. Originally, Aronofsky was slated to direct Hugh Jackman in "The Wolverine," another standalone film for his "X-Men" character. But then Aronofsky dropped that to return to the "Noah" project he has been developing for over five years. 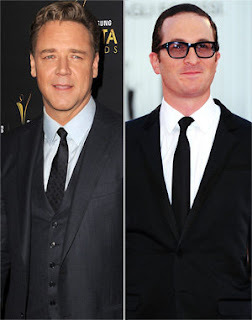 Christian Bale and Michael Fassbender were both previously mentioned as possible stars before Crowe. Aronofsky told Empire Magazine back in 2007 that his take on the Noah story was not a comedic one. He said, "This is definitely more the sci-fi version. It's the traditional Noah story, but it's told in a serious way." Aronofsky wrote the screenplay with Ari Handel ("The Fountain"), and it's being rewritten by John Logan ("Gladiator," "Hugo"). Crowe is currently at work on "Les Miserables," the movie version of the Tony Award-winning musical. He'll portray Inspector Javert, the obsessed policeman chasing after Jean Valjean, played in the movie by Hugh Jackman. And then before he plays Noah, he'll be seen as another character facing a disaster that endangers all life on his planet. He'll be Superman's Kryptonian father Jor-El in 2013's "Man of Steel."